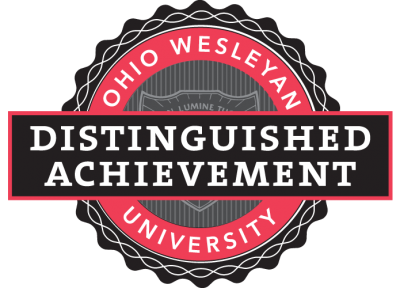 Over the years, Ohio Wesleyan has defined ways to recognize and honor its outstanding former students. By bestowing these awards on our most amazing alumni, we say “Thank you” for adding to the ever-increasing caliber of graduates who have walked across campus with an OWU diploma in their hands. The Distinguished Achievement Citation (D.A.C.) is the Alumni Association’s highest honor and is awarded to alumni who demonstrate professional accomplishment and outstanding service to humankind. View the list of honorees or nominate someone online. 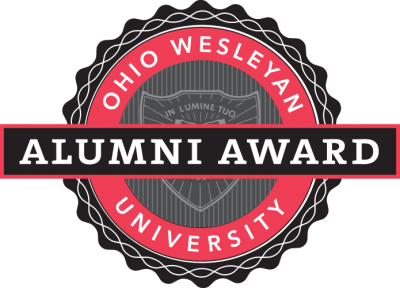 The Ohio Wesleyan Alumni Award is given to alumni who demonstrate outstanding service to OWU. 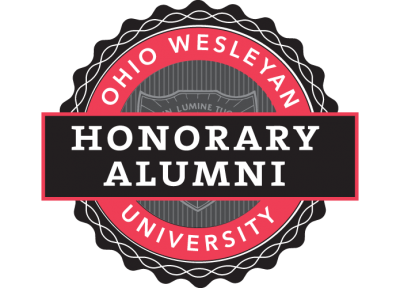 Honorary Alumni status is conferred upon persons who have exhibited consistent interest in and support of OWU for a significant period of time. 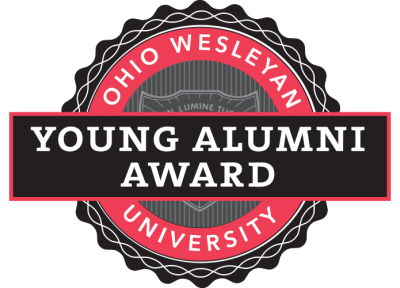 The Young Alumni Award is given to alumni who graduated in the last 15 years in recognition of a commitment to excellence in post-collegiate life and a significant or ongoing commitment to extraordinary work, research, volunteerism, or service to OWU. The Ohio Wesleyan Greek Alumni Award celebrates our Greek alumni who contribute to the OWU fraternity/sorority community. The Ohio Wesleyan Athletics Hall of Fame was founded in 1961—one of the first in the United States and the first to induct women. View past award recipients, and nominate an OWU alumnus or alumna online. In 1998, the Athletic Hall of Fame selection committee established an award to honor individuals who have made unusually significant contributions to the field of intercollegiate and professional athletics. This award is named in honor of longtime coach, athletic director, and dear friend Robert “Bob” Strimer. The first recipient was Thomas A. Butters ’60, emeritus director of athletics at Duke University. In 2008, the Athletic Hall of Fame selection committee established an award to honor individuals who exhibit outstanding lifetime commitment to OWU athletics and its student athletes. This award is named in honor of longtime coach and dear friend George Gauthier, and has been given twice to honor two outstanding alumni and their contributions to OWU and the continued success of our student athletes: Arthur A. Belt ’34 and Dale J. Bruce ’52.